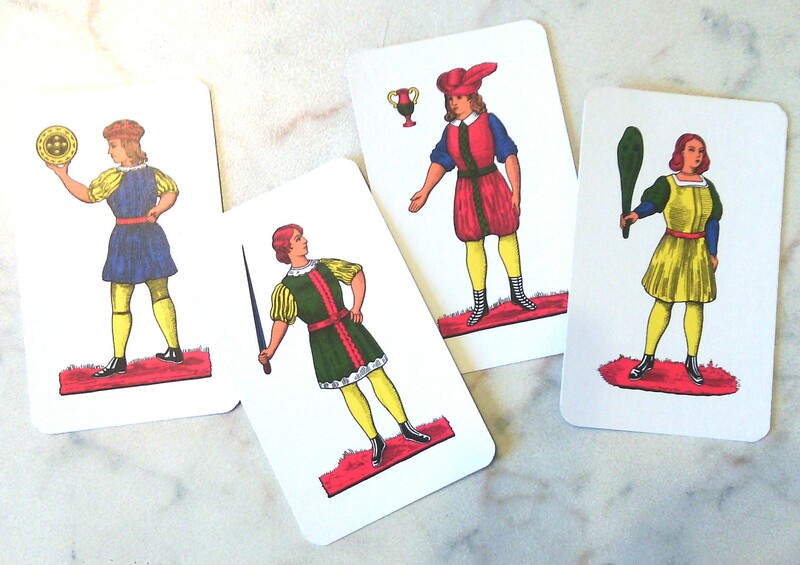 ‘SICILIAN CARD GAMES an easy-to-follow guide’ gives very clear instructions for twelve Sicilian card games, with photographic illustrations. 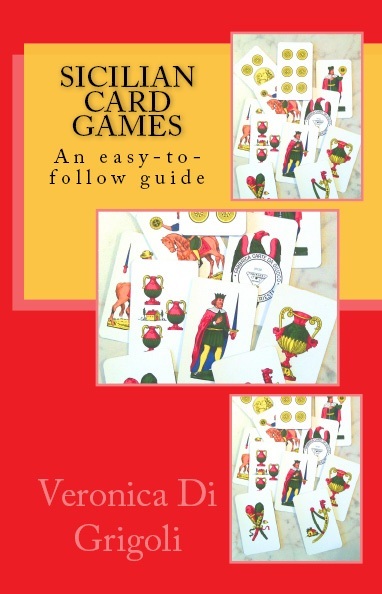 It is the only book of Sicilian card games in print worldwide. 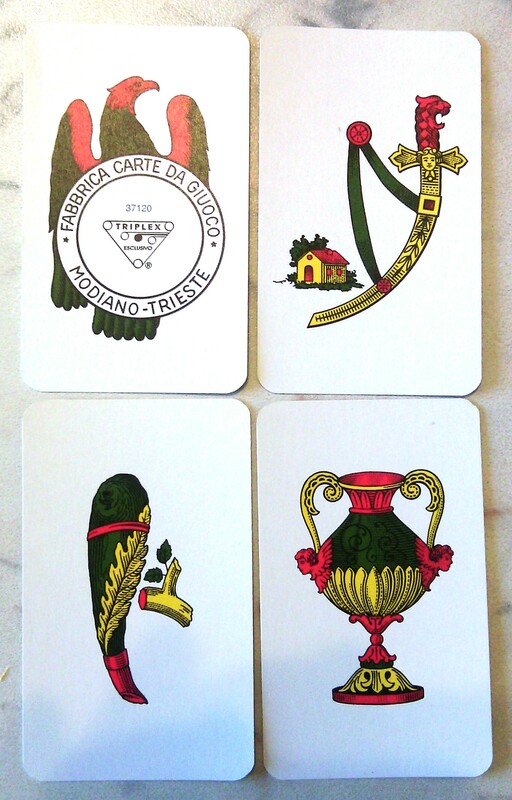 Sicily has its own unique deck of playing cards, and lots of games exclusive to the island. Card games are an indispensable part of the festivities at Christmas, Easter and other family gatherings. Many games are simple enough to be enjoyed by young children as well as older players. They are hilarious, but a great way to make children practise mental arithmetic without realising it. Other games are more complex and quite challenging. Most village squares have a full-time squadron of old men who play cards to pass the time. They shout loud enough to startle the dead and smack their winning cards down like a butcher hacking through bones with a meat cleaver. The games in the book are: Buona sera Signorina, Cavalli, Cu cu!, Camicia, Asino, Sette e Mezzo, Trentuno, Centocinque, Brìscula, Tresette, Terziglio, Scopa. The book includes an interesting explanation of the origins of Sicilian playing cards. This book makes an entertaining and economical gift for all ages. And it is written by your dear friend, The Sicilian Housewife! Here is a sample game from the book. This is a past-paced and hilarious game which requires speedy reactions rather than judgement. It is a great favourite with children… and adults who have not grown out of laughing! A Sicilian deck of 40 cards is used. Suits are ignored. Two or more. All players must be able to reach a single pile of cards at the centre of the table, which may place some limitations on the number of players. All the cards are dealt. Working anticlockwise around the table, each player turns up one card; each card is placed on top of the previous one at the centre of the table. The object of the game is to get rid of all your cards. If the card is an ace, everyone must slap their hand down on top of the pile of cards…. or on the hands of the previous players. The last person to perform the right action, or the person whose hand is uppermost when an ace is turned over, must take all the cards. If anyone performs the wrong action, he must take all the cards. If two players both happen to make the wrong action, they must divide the heap of cards between them and take half each. The first player to eliminate all his cards is the winner. Play continues and, one by one, players are eliminated. The game continues until one loser – who has the entire pack of cards – is found. This sounds really cool! My young grandsons love card games. 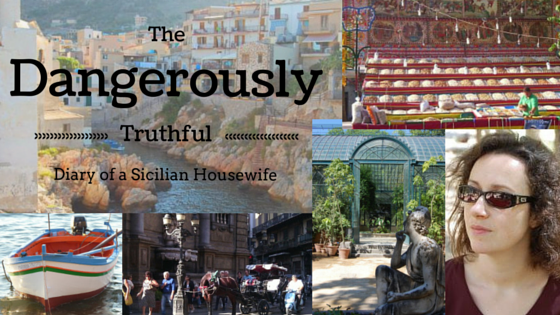 It’s time to introduce them to their 1/8 Sicilian heritage, which also bestowed upon them long, lush, dark eyelashes. Oh, I love those Italian dark eyes and long lashes! Thank you! I hope you’ll enjoy all the games! A brilliant idea for a book! 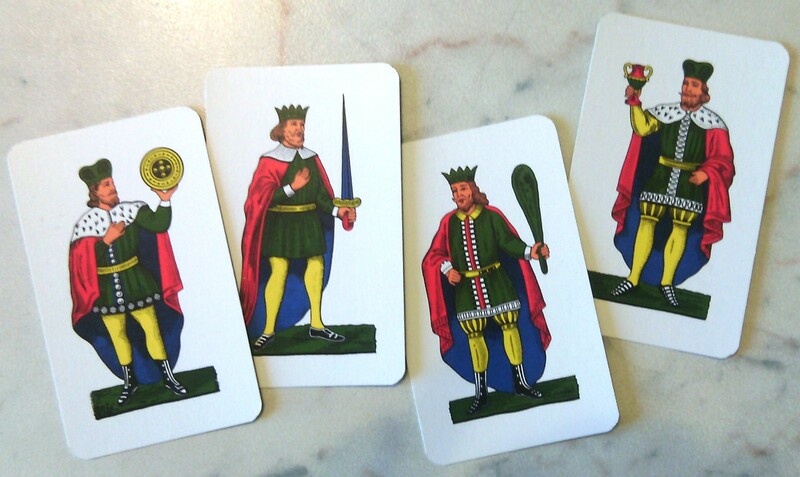 I grew up playing briscola and scopa and I’ve been introduced to tresette since my time here in Italy but it’s so complicated I always forget how to play it! 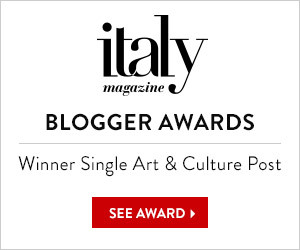 I love Sicilian cards they are almost a work of art in themselves!